One of the best parts about this blog are the pool/lake/swimming hole, swim-lit and swim-art recommendations that come my way. 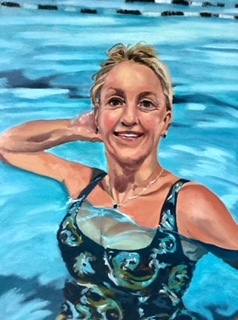 And this weekend, fellow morning swimmer Kerry Clare sent along this incredible swim art—artist Suzanne Moreau is painting all of the women in her aquafit class in her series, Bathing Beauties. Aren't they stunning? They're up at the Kent Farndale Gallery in Port Perry. 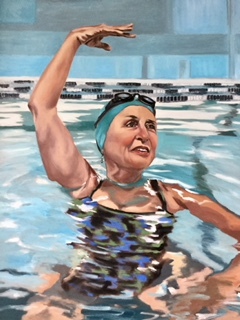 Makes me wish I could a) paint/draw and b) had painted/drawn all of my fast lane pals over the years, people whose names I don't remember, and maybe never knew, but people who I spent hours next to, trading small bits of our lives in the shallow end.